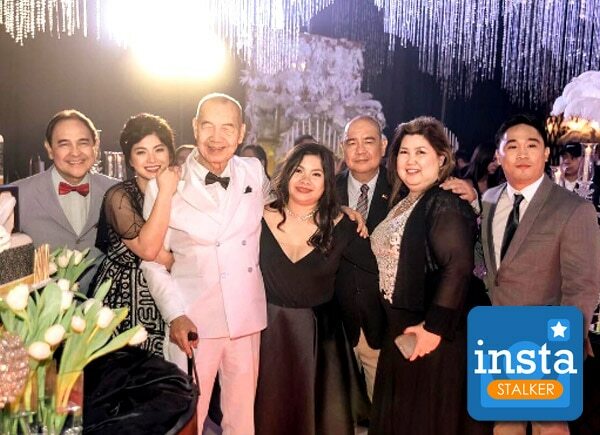 When Angel Locsin's dad turned 90, their family and some of the actress' close friends gathered and celebrated the joyous occasion. “Last night was a blast! We brought everyone together to celebrate Daddy's 90th birthday with our family. The preparation was overwhelming…” she wrote on Instagram. Happy birthday daddy Angel Colmenares ??? ?in photo with his loving daughter @therealangellocsin ???? Last night was a blast! We brought everyone together to celebrate Daddy's 90th birthday with our family. The preparation was overwhelming so it is only worthy that I give a big thanks to our suppliers for their outstanding service with awesome discounts and freebies to boot ?? A shout out to @eventstylistdave for the classy and chic venue styling, @niceprintphoto for the touching videos and coverage, @bethanydreamcakes for the free revolving cake tower and @insta_mug for the free souvenir pillows our guests got to take home. We couldn't have done it so fabulously without your help! Thank you!?? Special thanks to my glam team Ms. @lalaflores16 @randygabinmakeup @mikebawa @jonathanvelasco__ @nantealingasa @jayweehair @janra_ @myrrhlaoto @carvey_sam for taking good care of my family ?? To my ate @jd_ching @jamie_almario & ate jen sa pag aabala at pagmamahal ?? Thank you sa lahat ng nagpunta at nagpasaya sa daddy ko ?? Happy 90th Birthday Mr. Colmenares? Weloveyou!? Im happy to see you all smiles tonight @therealangellocsin ????? Glad I was able to witness a truly special celebration ?? Happy 90th Birthday, Daddy Angel! Such a wonderful man. ? ?Enjoyed the Gatsby inspired party. ???????? @therealangellocsin Thank You!